deal, interviews and documents show. according to internal documents and interviews. country or a terrorist group possesses smallpox. inoculate the entire U.S. population and quickly treat people exposed to the virus. when given within four days of exposure. Microphones accidently left on after G20 meeting pick up private conversation between US, French presidents. Sarkozy admits he ‘can’t stand’ Israeli premier. Obama: You’re fed up with him? I have to deal with him every day! According to a Monday report in the French website “Arret sur Images,” after facing reporters for a G20 press conference on Thursday, the two presidents retired to a private room, to further discuss the matters of the day. The conversation apparently began with President Obama criticizing Sarkozy for not having warned him that France would be voting in favor of the Palestinian membership bid in UNESCO despite Washington’s strong objection to the move. Green energy is little more than a way for President Obama to dole out federal dollars to his favorite firms at the expense of coal, oil, and natural gas producers. Green Energy: Damn the Facts, Full Speed Ahead! more Ph.D. scientists than are involved in the IPCC campaign. that depend upon coal, oil, and natural gas and some other organic compounds. he referred is the Kyoto Protocol. global warming alarmists refuse to accept. been taken out of the data set, and they haven’t bothered to divulge that fact. rise…but it would be an act of fraud. firmly in their camp. In fact, he is their champion. over the strong objections of liberal progressives. In 2008 alone, the U.S.
our economy (not to mention our national security) at risk. resources that we have in abundance. the United States to import oil and gas from another nation. not exist in green energy areas to meet even a smidgen of our energy needs. Having taught in a state university for thirty years, I’m not surprised by the ignorance on display among the Occupy Wall Street protestors. From kindergarten to university, for decades our schools have abandoned the teaching of basic facts and foundational thinking skills, and replaced both with leftish received wisdom and stale mythologies, all the while they have anxiously monitored and puffed up students’ self-esteem. This lack of critical understanding and ignorance of simple fact characterize the main theme of the protests, that the wealthy “1%” of Americans have gamed the system to enrich themselves at the expense of everybody else, an analysis redolent of Scrooge McDuck cartoons or Frank Capra’s portrait of Old Man Potter in It’s a Wonderful Life. But these caricatures are woefully uninformed about how a global, free market economy works. For example, the protestors rail about growing “income inequality,” but they forget that this expansion of the wealth of top earners has been accompanied by that same cohort’s paying more and more of the total federal tax bill, so that today nearly half of tax-filers pay nothing. Nor do they consider the issue of income mobility: from 1999-2007, about half of households in the bottom quintile had moved up the income ladder, while nearly half of households in the top quintile had moved down. As for those greedy “millionaires” who refuse to pay their “fair share,” in this same period, half were millionaires only once, and only 6% were millionaires for the whole nine years. Indeed, as the Treasury Department reports, among the top 1/100 of 1 percent in 1996––the group Mother Jonesdemonized for obscenely increasing their wealth over the last 30 years–– only 25% remained in this group in 2005, and the median real income of these taxpayers declined over this period. Finally, according to the Treasury Department, “Median incomes of all taxpayers increased by 24 percent after adjusting for inflation. The real incomes of two-thirds of all taxpayers increased over this period [1996-2005]. In addition, the median incomes of those initially in the lower income groups increased more than the median incomes of those initially in the higher income groups.” No doubt things have gotten worse for many because of the recession, but there are plenty of people to blame beyond the “1%” and Wall Street villains, from the federal appointees running Fannie Mae and Freddie Mac, to the home buyers lying on mortgage applications. This obsession with income inequality, moreover, reflects profound ignorance of capitalism’s revolutionary genius. To the protestors, the fact that top earners increased their income more than others did is prima facie evidence of capitalist skullduggery. They seem to think that a Steve Jobs or a Bill Gates has a zillion dollars because they somehow purloined money that in a just world other people would have had. Of course, in reality Microsoft and Apple have created hundreds of thousands of jobs and enriched others at the same time the corporations enriched themselves. That’s how capitalism works: it creates wealth that indeed spectacularly benefits the few, but that also raises the living standards of the many by creating jobs. More important, it is a dynamic, open system, one that creates opportunities for the clever and hardworking. And it has been wildly successful, so much so that today, young people who in the past would have started work at 16, can now spend several years of extended adolescence in colleges and universities, where they can earn impecunious degrees in subjects like Medieval French Poetry or Postcolonial Literature, and then loaf about lower Manhattan protesting the evil system that has rescued them from the drudgery of farm labor or factory work, and given them nutritious cheap food, healthy bodies, straight white teeth, and gadgets like X-Boxes and I-Pads. But to the therapeutic sensibility and the entitlement mentality cultivated by the schools, this success in spreading wealth to historically unprecedented numbers of people is not as important as the system’s failure to measure up to utopian standards and equally enrich everybody no matter how lacking in virtue or talent. The “creative destruction” of capitalism––which promises not wealth and success for everybody, but the opportunity for everybody to strive for success and wealth through their talents and virtues––is an intolerable injustice, one that must be remedied by the coercive power of the state. Hence according to a survey conducted by Democrat pollster Douglas Schoen, 65% of the Manhattan protestors believe that “government has a moral responsibility to guarantee all citizens access to affordable health care, a college education, and a secure retirement—no matter the cost.” Of course, that attitude is exactly what has created the looming economic crisis fueled by runaway entitlement costs that if not reined in, will double by 2050 and consume every dollar of federal tax revenues. The protestors are also ignoring the federal government’s role in creating the housing crisis by coercing and enabling banks to issue sketchy mortgages. And let’s not forget the fed’s role in inflating via federal subsidies the higher education bubble that has doubled tuition every nine years, and saddled so many of the protestors with the “injustice” of student loan debt, which since 1999 has increased 511%, and now totals $1 trillion. In the protestors’ desire to empower the federal government even more, we see how the ignorance of history enables such delusional utopianism. For underlying these demands is the necessity for redistributing income in order to advance the idea of radical egalitarianism, and that is a notion whose resultant tyranny and bloody failure is documented on every page of history, from the French Revolution to the Soviet gulags. But how would the protestors know that history? What passes for history in most schools today is a melodrama of Western wickedness against the oppressed “other,” accompanied by feel-good romances about the achievements of marginalized minorities. It reminds me of Jane Austen’s satiric History of England, in which she says her purpose is to “vent my spleen against & shew my hatred to all those people whose parties and principles do not suit with mine, & not to give information.” The result is the sensibility we see among many of those camping out in Manhattan’s Zuccotti Park: a penchant for decrepit ideas that are seductive to immature and undeveloped minds steeped in a sense of entitlement and an arrogant assurance of their own righteousness. Imagine a high-speed train zooming down hundreds of miles of glistening train track stretching across sunny California, connecting Anaheim to San Francisco. It’s a bullet train dream, and it’s a prime example of President Barack Obama’s latest plan to create jobs in America. The trouble is that this dream is far from reality. The Los Angeles Times reported this week that the California high-speed train–which is funded in part by $3 billion in federal grants from President Obama’s stimulus–is now expected to cost $98 billion, twice what was expected, and will take an additional 13 years to complete, extending the project to 2033. Questions remain about where the funding will come from, whether the project is viable, and whether the projected ridership will even materialize. But projects like these are central to President Obama’s plan to put Americans back to work. 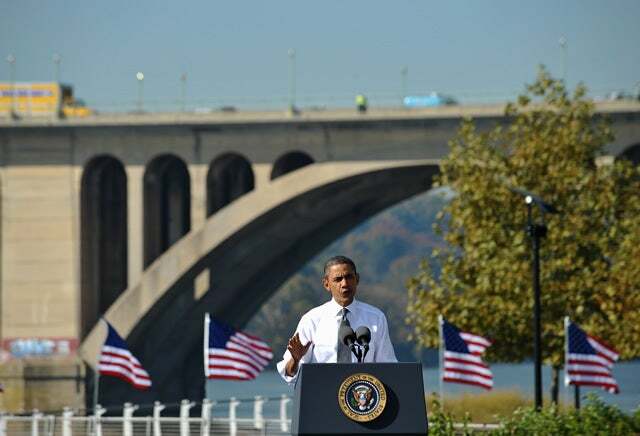 Speaking yesterday from Georgetown Waterfront Park in Washington, D.C., Obama declared that his plan will “put hundreds of thousands of construction workers back on the job rebuilding our roads, our airports, our bridges and our transit systems.” And that is, of course, all at the expense of the American taxpayers. The President once called these projects “shovel ready,” meaning that as soon as money arrived from the federal government, workers could be on the job. He made it sound as easy as flipping a switch, but unfortunately it didn’t work as planned. Despite a $787 billion stimulus package, America’s economy continues to languish with 14 million out of work and a 9.1 percent unemployment rate. The President joked, “Shovel-ready was not as shovel-ready as we expected.” Though he didn’t use the phrase “shovel-ready” in his remarks yesterday, the implication was still there. If Congress approves his jobs plan, he argued, all the construction workers sitting on the sidelines will be put back to work overnight. Building and repairing roads and bridges neither creates net job growth nor boosts the economy in the near term. First, increasing government spending on these projects simply moves resources from one place to another — it may employ construction workers, but only by reducing jobs in other sectors. Further, the money never gets out the door soon enough to promote near-term job growth. And then there’s the President’s flawed argument that since others are doing it, the United States should be, too. “How do we sit back and watch China and Europe build the best bridges and high-speed railroads and gleaming new airports, and we’re doing nothing?” he asks. It’s not a new line of argument from the President, and it leaves out some very important facts. Dating all the way back to the 2008 presidential campaign, Obama spoke of the need to “invest” in infrastructure in order to be competitive with the likes of China. At the time, Jim Geraghty reported at National Review Online that while Obama puts China on a pedestal, he entirely overlooks some serious problems with transportation in China–namely, stories of severe power shortages affecting the country’s exports, an episode where 500,000 train passengers were left stranded for days, and outbreaks of violence where airplane travelers were left grounded without accommodation. And that’s not to mention the working conditions under which China builds its infrastructure. In Europe as a whole (EU-27), rail accounted for only 6.1 percent of passenger travel in 2007, including travel by air and sea. Buses accounted for 8.3 percent of the market, and air travel accounted for 8.8 percent. Despite Europe’s huge investment in passenger rail, its market share declined from 6.6 percent in 1995 to 6.1 percent in 2007. Over that same period, commercial air increased its share from 6.3 percent to 8.8 percent. By providing faster service and competitive prices, it took passengers away from rail, buses, and autos. But to hear President Obama tell the story, building a European- or Chinese-style infrastructure is the key to the future–and to creating new jobs. Workers are ready to go, and all they need is your money to get started. But this is something we tried once already with the last stimulus, it didn’t work, and it’s not going to work this time, either. Obama’s infrastructure plan is a train that shouldn’t leave the station, headed for a bridge to nowhere, and jobs are the last thing that it will deliver.